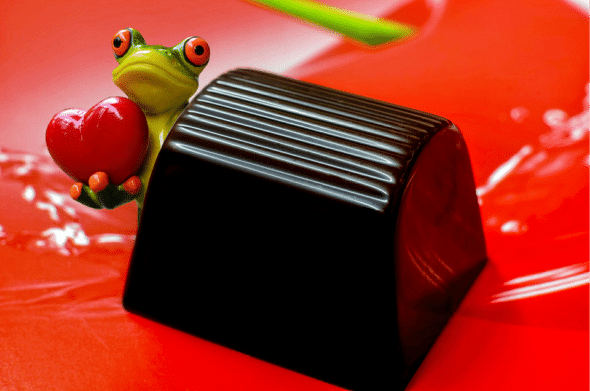 When the town crank croaks the only clues left behind are a postal encounter, a frog-green canoe, a chocolate from the fancy store in town, and one conversation the local chocolatier (Lee McKinny) had with the supposed victim. What ignites a town quicker than a wild fire and is more deadly than a tainted piece of chocolate – gossip. Lee’s almost-serious boyfriend, Joe, is the leading suspect on everyone’s radar. Wasn’t he confronted by the victim, the day before, and accused publicly of some dirty dealing; and doesn’t the victim’s telltale lime green canoe lay smashed up on Joe’s property? Lee, however, knows her new beau better . . . or does she? When the local gossip gets personal, Lee begins to wonder if there are multiple reasons to worry. When her romantic date with Joe turns deadly and it appears that a killer is still on the loose, the plot thickens. Lee must figure out who the killer is, and how Joe is connected to both the murder and the less than savory gossip, before she becomes the second victim. 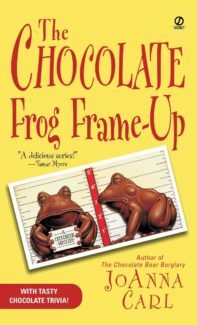 My first foray into the Chocaholic series begins with this, book three in the actual series. It all began with another of my random eBay hauls of assorted mysteries, a general grab in the direction of the bookshelf where these prizes live, and voila, I encounter author JoAnna Carl and her vivid, cozy world of Warner Pier, Michigan. The result was a book I rapidly worked my way through and a follow-up order with Amazon to get the first book in the series. Carl’s world is suitably vivid and cozy, strewn with details of chocolate making (enter the fictitious TenHuis Chocolade where Lee works alongside her aunt), a budding relationship, a town with a rich historical focus, vintage boats, and, of course, characterizations that live onwards. We have the vic, one Hershel Perkins, with his frog-like demeanor, reputation for being a little mental (although, probably harmless), and his peculiar green boat. Then there is Lee – the protagonist through whom we experience the escalating mystery. She is warm and affable, yet still quite human and subject to doubt yet strong in her determination to find justice. While cozies always require us to stretch the boundaries a little, imagining a seemingly inept albeit well-meaning citizen taking on the mantle of a village Perry Mason, Lee’s fall into the role and its circumstantial elements helps us to not only accept but believe her need to sleuth. After all, Hershel himself drug her into the fray and the killer knows this and is on the path to war. It’s in her best interests to save both her boyfriend’s and her life. Joe mainly fits in as a secondary character and along with Lee, we like him but don’t fully trust him yet. As their relationship, doomed to interruption from a homicidal schemer, develops we learn them as they learn each other. The drama of their confrontations with the unknown murderer also leaves them very emotionally vulnerable and helps to build the bridge between the two while still showcasing their independence and tentative desire for a relationship. The action throughout Chocolate Frog Frame-Up is fairly intense for a cozy, making the pages in the book fly. There is little down time and no wasted time or filler. The characters are investigating for their lives, even when they don’t want to be. Situations escalate and events pile onto one another, some through clues, others through the typically poor decisions of characters in a mystery novel, and still others through the clever groundwork of a killer who wants to hide the evidence. At the end, we have a tie-in with that chocolate frog and, at last, a killer with a motive. How we get there, and how they survive – and whether or not they catch the killer before he makes a run – is for you to find out. You’ll most certainly want to and enjoy the trip through a world that is well crafted and detailed without ever becoming overbearingly complex. This is cozy mystery fair at its finest and has convinced me to add this series to my ever growing reading pile.